Kick off your visit on the 13th (Fri): stroll through Kata Beach, then get great views at Nai Harn Beach, then enjoy the sand and surf at Ya Nui Beach, and finally soothe aching muscles at some of the top local wellness centers. Get ready for a full day of sightseeing on the 14th (Sat): tour the pleasant surroundings at Karon Beach, then kick back and relax at Freedom Beach, and then enjoy the sand and surf at Patong Beach. To find more things to do, ratings, other places to visit, and tourist information, read our Karon online itinerary creator. Washington DC, USA to Karon is an approximately 33-hour combination of car and flight. The time zone changes from Eastern Standard Time (EST) to Indochina Time (ICT), which is usually a 12 hour difference. Expect much hotter temperatures when traveling from Washington DC in January; daily highs in Karon reach 89°F and lows reach 73°F. Finish up your sightseeing early on the 15th (Sun) so you can travel to Ko Phi Phi Don. Start off your visit on the 15th (Sun): kick back and relax at Laem Tong Bay, explore the activities along Maya Bay, then explore the striking landscape at Viking Cave, and finally stroll through Loh Moo Dee Beach. Get ready for a full day of sightseeing on the 16th (Mon): see some colorful creatures with a scuba or snorkeling tour, then kick back and relax at Loh Dalum Beach, then relax and rejuvenate at some of the top local wellness centers, and finally make a trip to Koh Phi Phi Viewpoint. For photos, ratings, and tourist information, you can read our Ko Phi Phi Don itinerary builder. Traveling by combination of taxi and ferry from Karon to Ko Phi Phi Don takes 2.5 hours. In January in Ko Phi Phi Don, expect temperatures between 89°F during the day and 72°F at night. 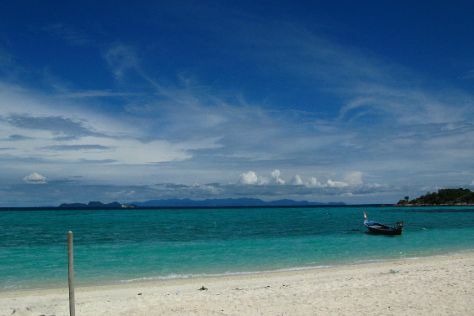 Wrap up your sightseeing on the 17th (Tue) to allow time to ride a ferry to Ko Lipe. With a name that means "Paper Island" in the local Chao Ley language, Ko Lipe is known for its white sand beaches, historical villages, and diving attractions. Start off your visit on the 17th (Tue): enjoy the sand and surf at Sunrise Beach. Get ready for a full day of sightseeing on the next day: kick back and relax at Sanom Beach, then enjoy the sand and surf at Sunset Beach, and then tour the pleasant surroundings at Pattaya Beach. To find traveler tips, where to stay, ratings, and more tourist information, use the Ko Lipe custom trip planner. Traveling by ferry from Ko Phi Phi Don to Ko Lipe takes 4.5 hours. Due to the time zone difference, you'll lose 1 hour traveling from Ko Phi Phi Don to Ko Lipe. In January, plan for daily highs up to 89°F, and evening lows to 77°F. Finish up your sightseeing early on the 19th (Thu) so you can catch the ferry to Ko Lanta. Start off your visit on the 19th (Thu): see some colorful creatures with a scuba or snorkeling tour. On the 20th (Fri), you'll have a packed day of sightseeing: enjoy the sand and surf at Lanta Klong Nin Beach, kick back and relax at Long Beach, and then enjoy the sand and surf at Khlong Dao Beach. For where to stay, traveler tips, ratings, and tourist information, read Ko Lanta online itinerary creator. Ride a ferry from Ko Lipe to Ko Lanta in 3.5 hours. The time zone changes from Malaysia Time to Indochina Time, which is usually a -1 hour difference. Plan for slightly colder nights when traveling from Ko Lipe in January since evenings lows in Ko Lanta dip to 72°F. Wrap up your sightseeing by early afternoon on the 21st (Sat) to allow enough time to travel to Ko Pha Ngan. Visiting Thong Nai Pan Noi and Haad Yuan Beach will get you outdoors. 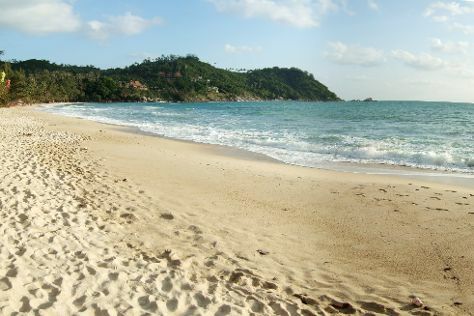 We've included these beaches for you: Thong Nai Pan Yai Beach and Haad Yao Beach. The adventure continues: enjoy the sand and surf at Salad Beach and tour the pleasant surroundings at Ao Chaloklum Bay. For reviews, traveler tips, maps, and more tourist information, refer to the Ko Pha Ngan tour planner. Do a combination of ferry, car, and flight from Ko Lanta to Ko Pha Ngan in 5 hours. Alternatively, you can do a combination of ferry and bus. Traveling from Ko Lanta in January, you can expect nighttime temperatures to be somewhat warmer in Ko Pha Ngan, with lows of 78°F. Wrap up your sightseeing on the 24th (Tue) early enough to travel back home.